Julien Paluku, governor of North Kivu province, announced the outbreak on Twitter, just a week after Congolese and U.N. health officials announced the end of a separate outbreak that killed 33 people in the country’s northwest. There is no evidence yet suggesting the two outbreaks in the Congo are linked. “Although we did not expect to face a tenth epidemic so early, the detection of the virus is an indicator of the proper functioning of the surveillance system,” said the country’s health minister, Oly Ilunga Kalenga, in a statement. Ebola was first identified in the Congo in 1976. A highly infective virus, it can be spread via contact with animals or the bodily fluids of the infected — including the dead. 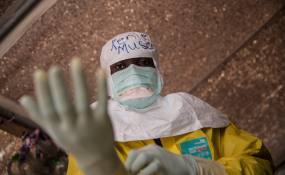 "We had a vaccine — and that I think is going to be extremely important for the future of Ebola control," Peter Salama, deputy director-general of emergency preparedness and response at the World Health Organization, told CNN of the July outbreak.